Excessive sodium in our diet can increase our blood pressure, especially in salt-sensitive individuals. High blood pressure, or hypertension, is a major risk factor for cardiovascular disease. Heart disease and stroke are the first and fourth leading causes of death in the U.S., making cardiovascular disease responsible for one of every three deaths in the country. Americans suffer more than 2 million heart attacks and strokes each year, and every day, 2,300 people die from cardiovascular disease. Reducing sodium in our diets is an important way to lower our risk. Hypertension, or high blood pressure, is elevated pressure or force that circulating blood exerts on the artery wall. Uncontrolled hypertension can damage the interior wall of blood vessels, which can lead to several serious health conditions. Americans consume an average of 3,000 to 3,600 milligrams (mg) of sodium a day, more than twice as much as the American Heart Association recommends. Sodium is a mineral naturally found in our bodies and the foods we consume in the form of sodium chloride (NaCl), or table salt. Sodium is important to the body because it regulates fluid balance and generates electrical signals for nerve and muscle function. Q: How much sodium is in table salt? Q: Why should I be concerned about my sodium intake? When we eat too much sodium, our body retains more water to maintain the proper fluid balance, resulting in high blood pressure, or hypertension. Hypertension puts an extra burden on your heart and blood vessels, which can cause damage throughout the body. Also, excessive sodium can increase loss of bone calcium, which puts us at a higher risk for osteoporosis. Reducing the amount of sodium in your diet may help you lower your risk for high blood pressure and osteoporosis. Q: How much sodium should I have each day? The American Heart Association recommends 2,300 mg for the general population. This works out to be about 1 teaspoon of salt. Those with prehypertension or hypertension should aim for 1,500 mg or less per day. Q: How does high blood pressure affect my long-term health? Because blood vessels are throughout the body, uncontrolled high blood pressure can cause a variety of problems in many locations. The increased pressure of blood flowing through your arteries can cause narrowing and damage to the inner lining of the vessel wall, resulting in hardening of the arteries. Fats from your diet enter your bloodstream, pass through the damaged cells and collect to start plaque buildup. Through time, the increased pressure can cause aneurysms, which are weak spots in vessels that can bulge and sometimes rupture. The heart, which has to work harder when blood pressure is high, also is affected. It can become damaged and weak, which eventually can lead to heart failure. Damage to the arteries in the brain can deprive the brain of oxygen, which can cause a stroke. High blood pressure is one of the most common causes of kidney failure. It can damage the large arteries leading to your kidneys and the tiny blood vessels in the kidneys. Q: Will I have to sacrifice flavor to reduce the sodium in my diet? Like many things in life, salt is an acquired taste. We build up a tolerance for it and we “expect” it in the foods we eat. If you gradually reduce the sodium in your diet, you’ll slowly adjust to the less salty flavor. Experimenting with new recipes that rely on herbs and spices instead of salt to enhance the flavor of the meals can be a great way to enjoy your food without the negative health effects of sodium. Q: What are the common sources of sodium? Americans consume 70 percent of their sodium from processed foods, not from table salt. 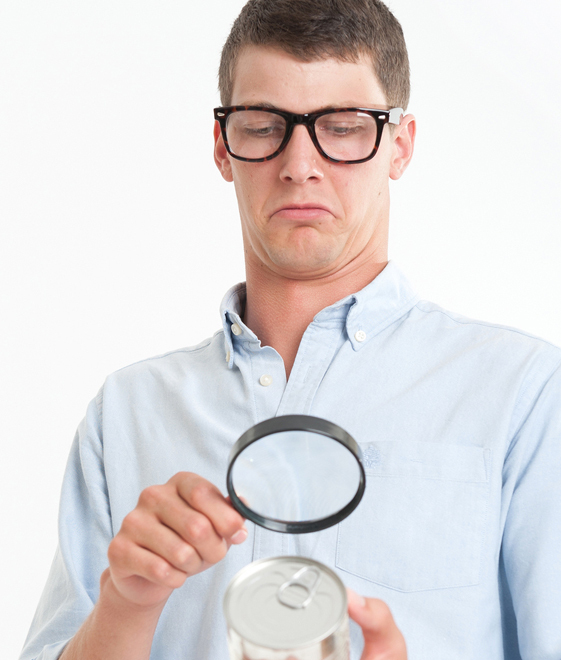 Read the labels when you buy prepared and packaged foods and watch for the words “soda” (referring to sodium bicarbonate, or baking soda) and “sodium” and the symbol “Na.” These products contain sodium compounds. Sea salt and kosher salt also are forms of sodium chloride..
Q: How do I reduce sodium in my diet? One way to reduce sodium is to eat foods that are naturally low in sodium, such as fruits and vegetables. Limit processed foods such as ham or frozen dinners and restaurant-prepared foods. Prepare homemade meals because you have the most control of how much sodium gets added. When you are in a grocery store, opt for “low in sodium” or “reduced sodium” products. 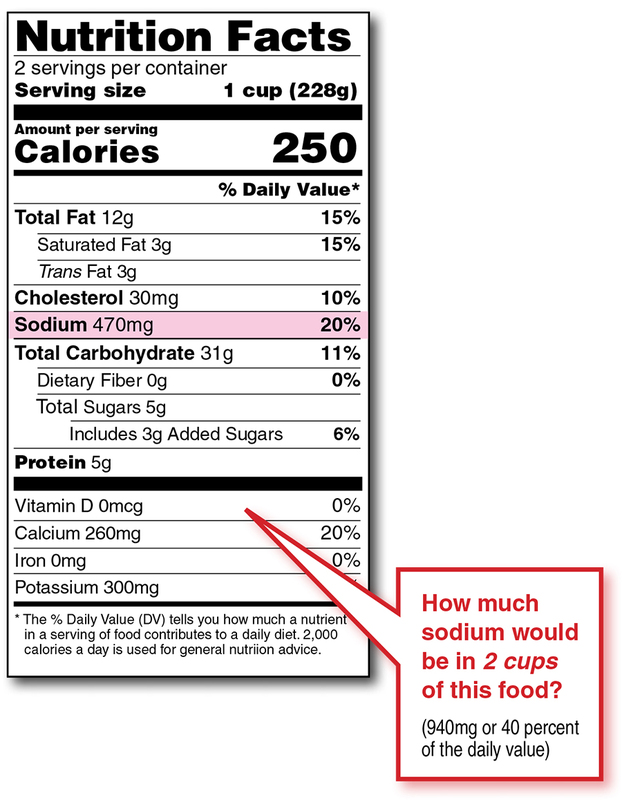 Read Nutrition Facts labels and note the milligrams of sodium per serving and the “percent daily value.” For example, if the food has 52 percent of the daily value, you have consumed more than half of your daily sodium recommendation.